Munich is famous for its rowdy Oktoberfest, but you don't have to go to Germany to join this fall tradition. 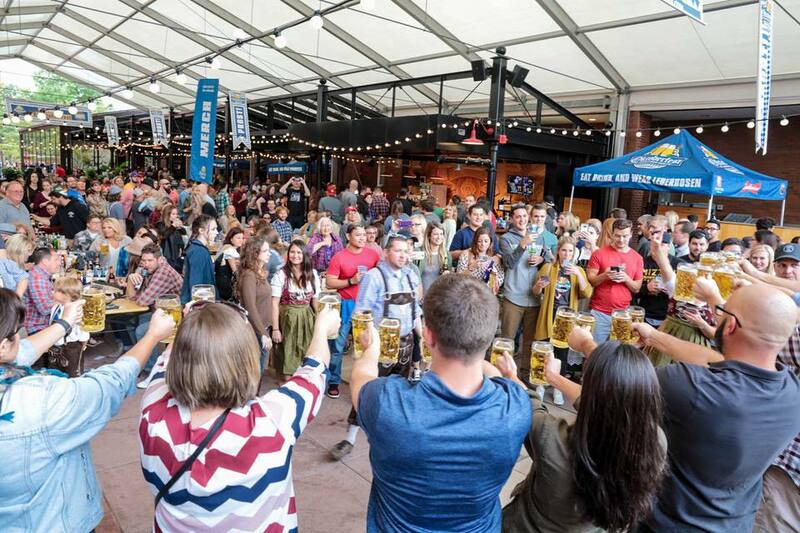 St. Louis is proud to show off its German heritage at Oktoberfest celebrations throughout the area, so plan ahead for the best beer-filled festivities. Cheers! Soulard Oktoberfest, one of the biggest parties in St. Louis, will be held in October at the Soulard Farmers Market. Founded in 1779, it is the oldest continually run farmers market west of the Mississippi. There will be a bier hall, authentic German fare, a wine garden, and live music by bands like The Dueschmeister Brass Band and the Bavarian Stompers. The Anheuser-Busch Brewery in St. Louis is hosting a two-week Oktoberfest celebration with German music and entertainment, plus with a variety of German-style beers and food. The celebration begins Friday night with the tapping of the first keg. The celebration also includes games like barrel rolling and stein relays. Every Sunday is Family Day with added entertainment for kids including bounce houses, face painting, and a petting zoo. Following the tradition of the Munich festival, Saint Charles also hosts its Oktoberfest in September. The festival is held in Frontier Park along the Missouri River. There's live music and dancing all weekend long on the main stage and in the beer tents, plus a parade, craft booths, antique car show, and wiener dog race. Children can spend their time at a special carnival featuring arts, crafts, and kid-friendly entertainment. The St. Charles Oktoberfest grounds are also just a few blocks from Historic Main Street and its dozens of restaurants and shops. Belleville may be French for "beautiful village," but many residents in the Metro East town are actually of German descent. Dozens of vendors set up shop around the public square on Main Street to sell German specialties and many other kinds of food and drink. There's also live music each evening, a wiener dog race, a corn hole tournament, a classic car show, and a kids' area with pumpkin decorating, face painting, and crafts. Urban Chestnut and other local breweries are teaming up for an Oktoberfest celebration along Washington Avenue in midtown St. Louis. The three-day event is filled with German music, food, and beer. It will be held at the Midtown Brewery & Biergarten in late September. A glass beer stein is $10 and refills are $8. Hermann celebrates its German roots all year long, but the small town along the Missouri River really comes to life each weekend in October. Every year, thousands of visitors come to Hermann to enjoy the polka music, German food, and local wines. There are Oktoberfest events throughout town, but most visitors head to Hermann's two biggest wineries, Stone Hill and Hermannhof. Stone Hill, Missouri's award-winning winery, sits on a hill overlooking Hermann and is a perfect place to sip wine and take in the fall colors. For a more lively celebration, head to Hermannhof's Festhalle, which has German music, lively crowds and plenty of brats, sauerkraut, and other German food. There is also an Oktoberfest Bier Garten in Sesquicentennial Park on Gutenberg Street. Augusta is located in the heart of Missouri wine country and it doesn't take long to notice the area's strong German roots. Naturally, October is one of the best times of the year to visit. Although there's not an official town-wide Oktoberfest celebration, there's no shortage of festivities. For example, large crowds head to Mount Pleasant Winery each weekend in October for its great views and to hear popular local bands. While in the Augusta area, check out the Montelle and Blumenhof wineries, and be sure to try an original brew at the Augusta Brewing Company.